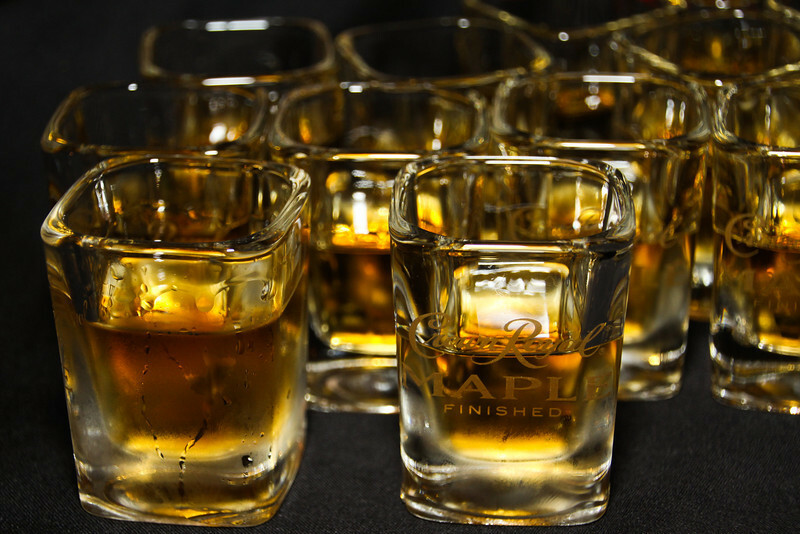 Crown Royal Maple - Give it a shot! 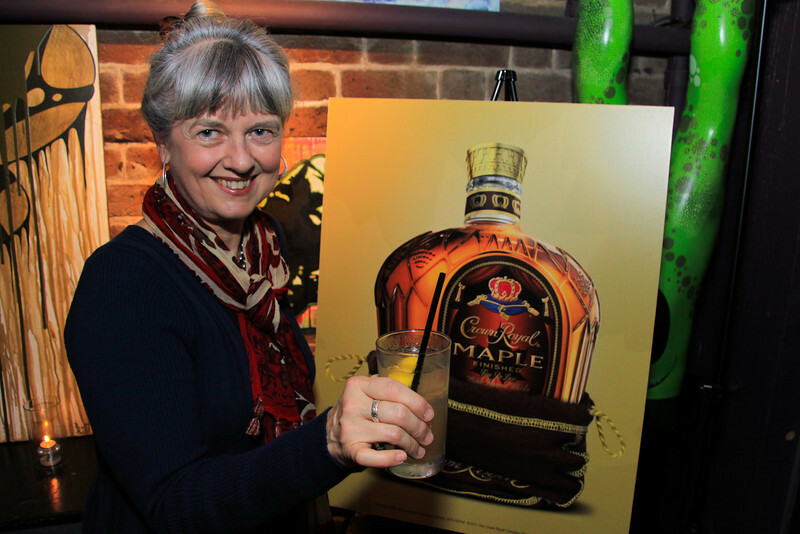 Crown Royal Maple tasting event, Social, East Bay St., Charleston, S.C. 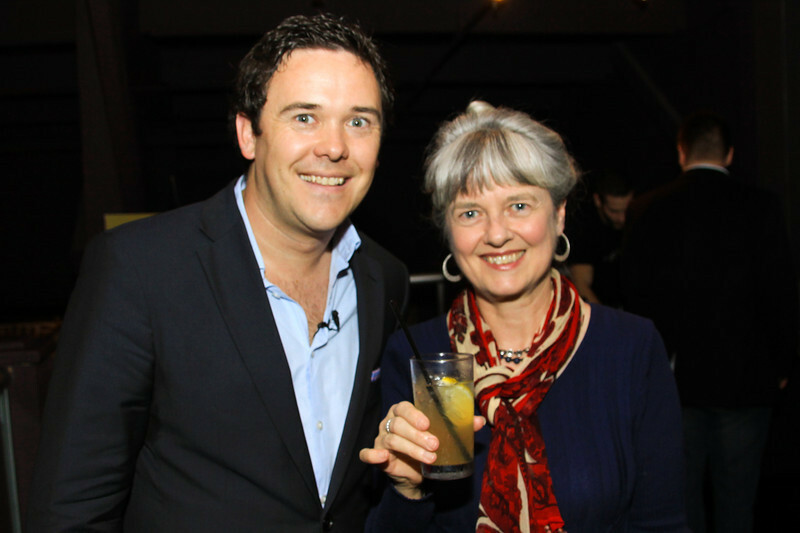 It is nice to blog enough to be considered worth inviting to media events. 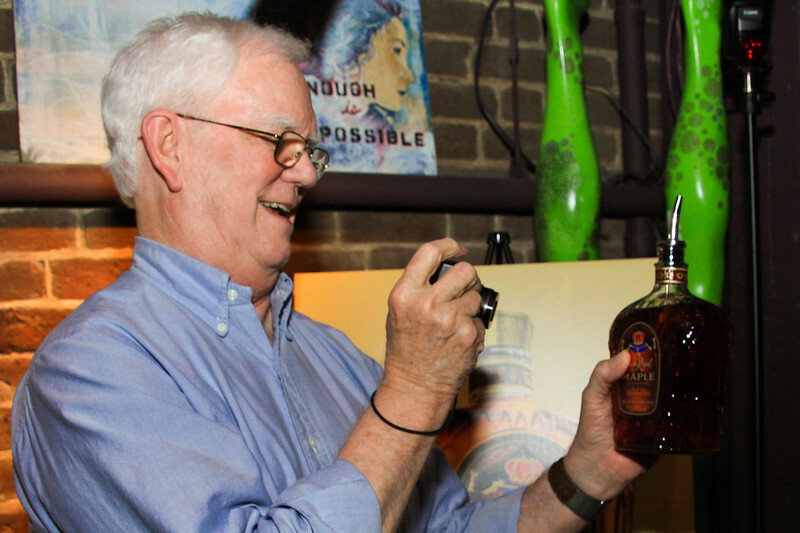 This evening I was invited to a tasting party for the new maple flavored Crown Royal Whisky at Social. I invited fellow blogger Chuckography thinking two bloggers were better than one. I may be in the minority but I don't get the idea of shots. If a drink is worth drinking I want to taste it so I tried The Manitoba which was mixed with Ginger Beer. I did like it. There was a nice sized group and lots of media presence gathered for the brief presentation, toast and demonstration on how to mix drinks. 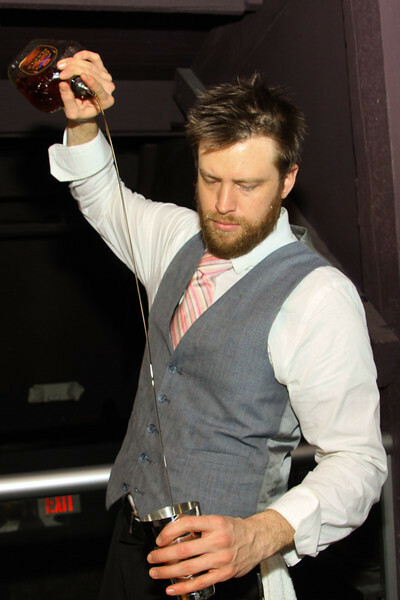 We left as participants were invited to try their hand at mixing their own shot recipe. I am not sure that I would buy a bottle but I can see enjoying a mixed drink with it in. The maple taste is quite strong but I do love maple! That is MY drink being mixed in the last photo. 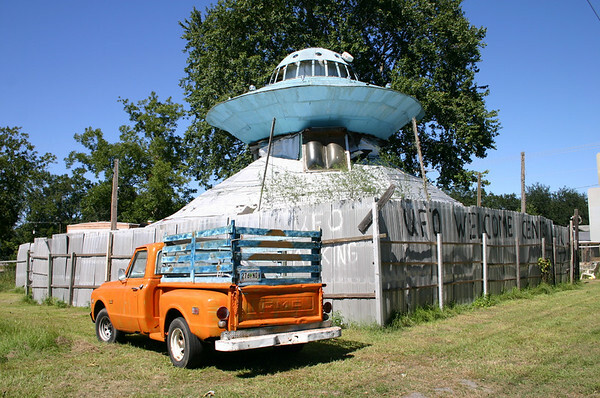 UFO Welcome Center, Bowman, S.C. 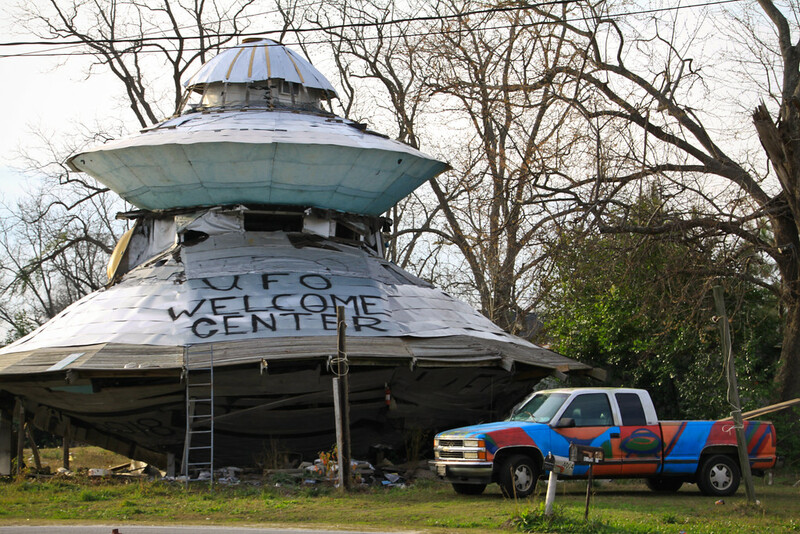 It may hold a place of honor in the Backroad Wonders of South Carolina, but the UFO Welcome Center in Bowman, S.C. looks a little worse for wear. The fence is down and the siding is flapping in the breeze. The UFO may actually take off flying in a significant storm. Then who will we have to welcome the aliens? It is a sad state of affairs. The top, more recent photo was taken a week or two ago. The bottom one is from 2004. I hope everyone is doing well and staying healthy through this wicked flu season. I've been very busy at work lately as we seem to be rushing headlong into 2013. In other news, I got a new refrigerator this morning - yipee! It isn't a fancy schamcy thing but it does have a bottom freezer which I think I will like. I just got back from Lowes after deciding I was brave enough to paint a piece of wooden furniture. Pinterest, I tell ya. It is a dangerous place to hang out. 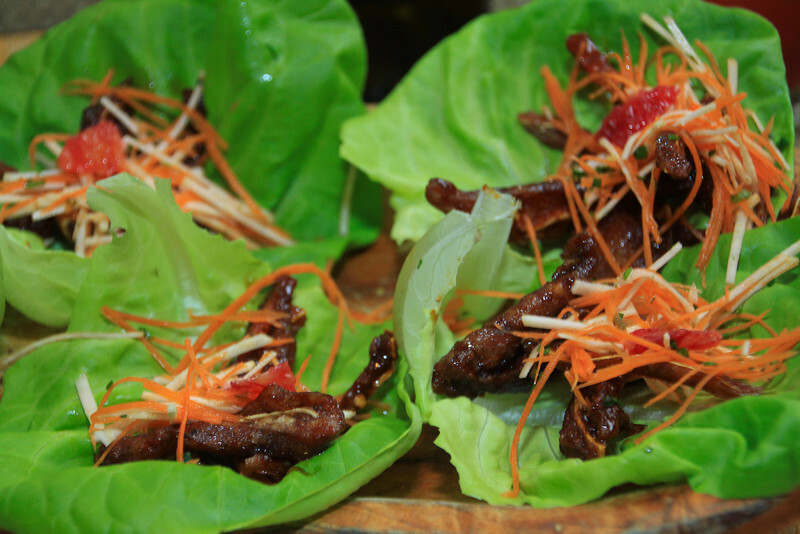 There are pictures of amazing recipe ideas and crafty projects. As I checked out at Lowes the cashier told me everyone in Charleston must be painting something this weekend. 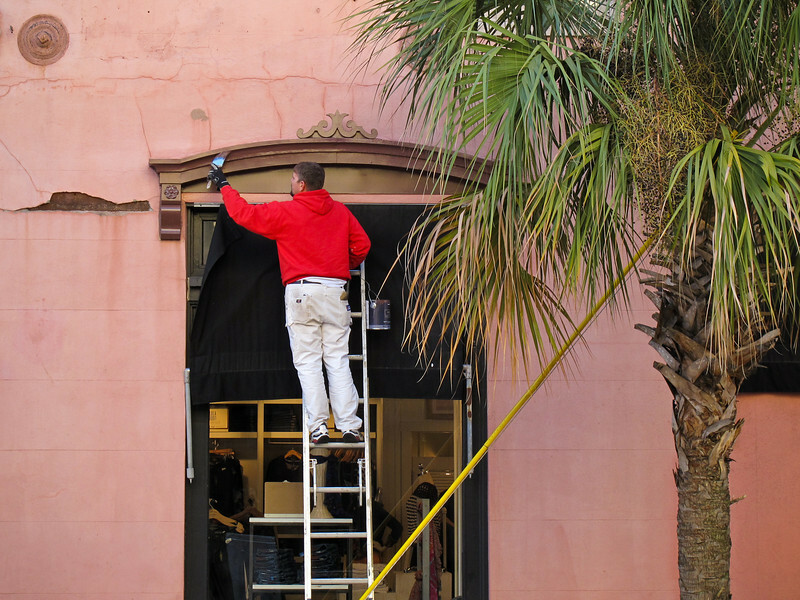 The gentleman I caught above is painting the outside of the Lucky Brand store at King & Wentworth St. I hope my project turns out as well as his did. I went to the the Cirque de Soliel performance with the Charleston Symphony today. It was grand. When those performers fly through the air so gracefully I want to clap my hands and beg for more. Amazing. 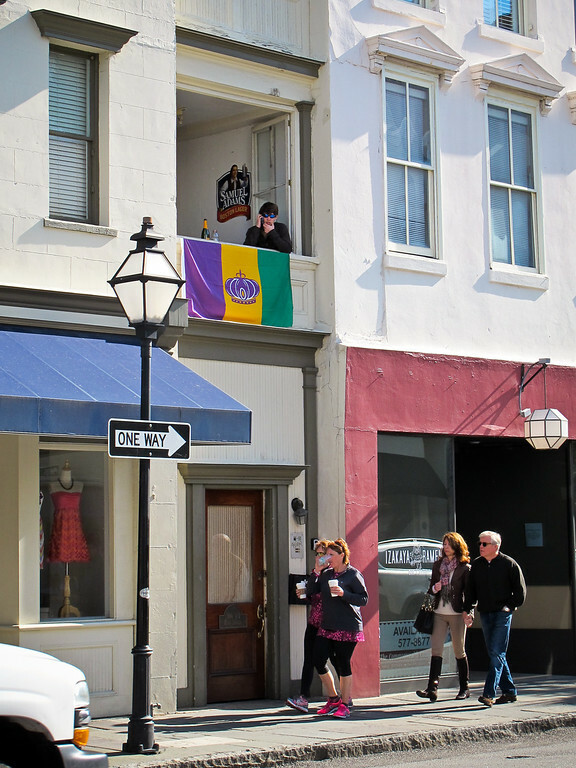 Dr. Clifford honored with Real Award, Charleston, S.C. Some people enlighten us. Some people entertain us. Some people save our lives. Back in December I asked y'all to consider voting for Dr. Clifford for the Real Awards, a new award for front line health care workers sponsored by Save the Children. He won in the Pediatric category! Yippee! Since it was my idea to nominate him and I typed his info in on the very last day, I was invited over when the Save the Children staff came down from Washington, DC this morning to honor him. He is invited (paid trip) to go to Washington in April for the award ceremony. I am proud as punch. Voting was a small part of the selection but it certainly was considered and I thank everyone who supported this terrific gentleman. Dr. Clifford’s passion for humanitarian medical work began during an undergraduate foreign study trip to Kenya. Now serving on the Board of Directors for Remember, a not-for-profit ministry to the persecuted church, Dr. Clifford has led medical teams into Thailand, Burma, China, Jordan and Iraq. Understanding the desperate need in struggling communities around the globe, Dr. Clifford has treated thousands of children with little to no access to healthcare. Dr. Robert Clifford is a general pediatrician with Coastal Pediatric Associates in Charleston, S.C. and is on the Clinical Teaching Faculty at the MUSC Children’s Hospital. His interests include international pediatrics, immunization advocacy and preventive care. 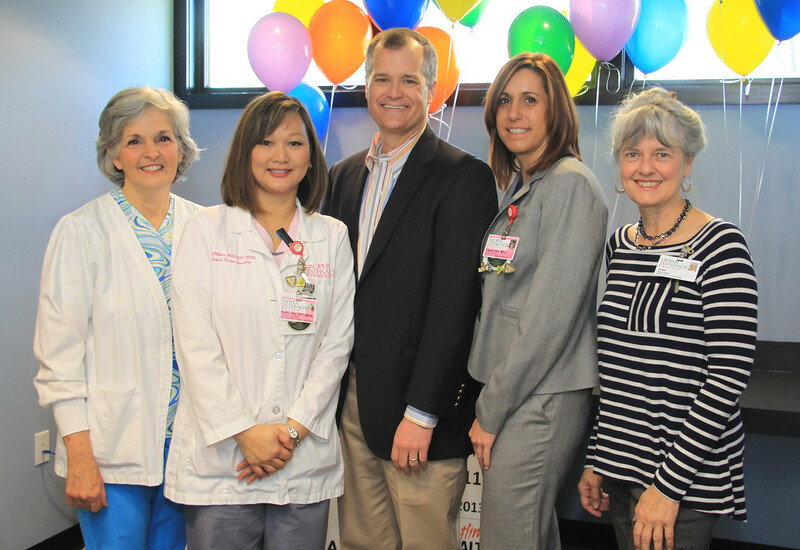 Currently serving as the Chairman of Pediatrics at Roper and St. Francis Hospitals, he certified by the American Board of Pediatrics and is a Fellow of the American Academy of Pediatrics. 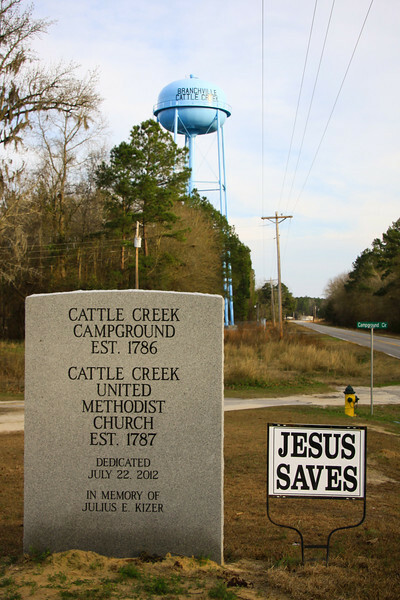 I've featured a couple of these church based campgrounds and this evening I am presenting Cattle Creek. 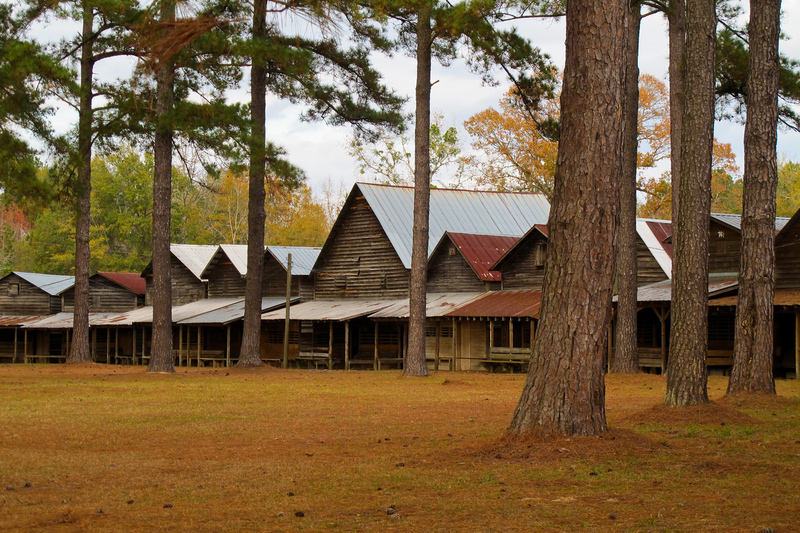 Wooden tent cabins are built in a circle and used once a year for revival style camps. There were a few differences at this camp. Piles of hay appear to be delivered to each unit to cover the dirt floors. 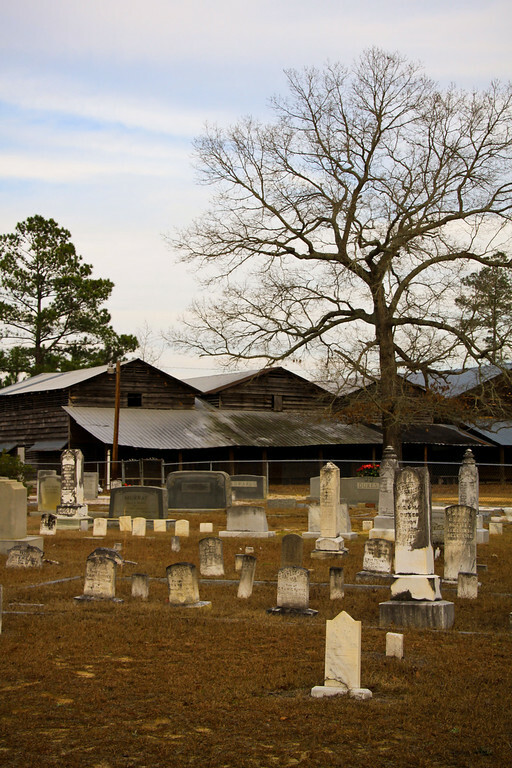 Cattle Creek has a proper white church and a cemetery on the property so the cabins didn't form a complete circle. The meeting house was still in the middle. 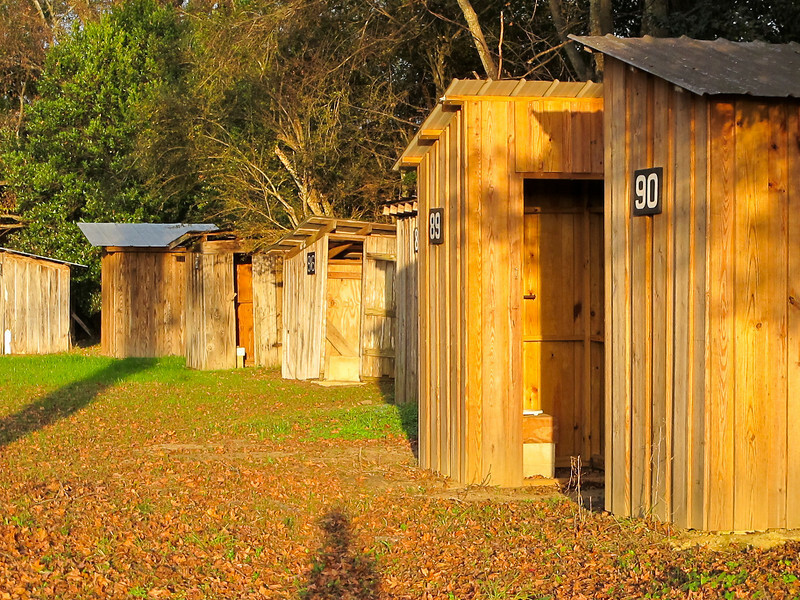 There wasn't much evidence of outhouses and I read that some of the campgrounds now have porta-lets delivered. The campgrounds are usually used once a year but this one had a bonus July agenda posted on the door. It recommended that children were bathing suits to Children's Services. Edit: Sorry for the typos, kids. I discover some of them in the morning and patch the entry up. 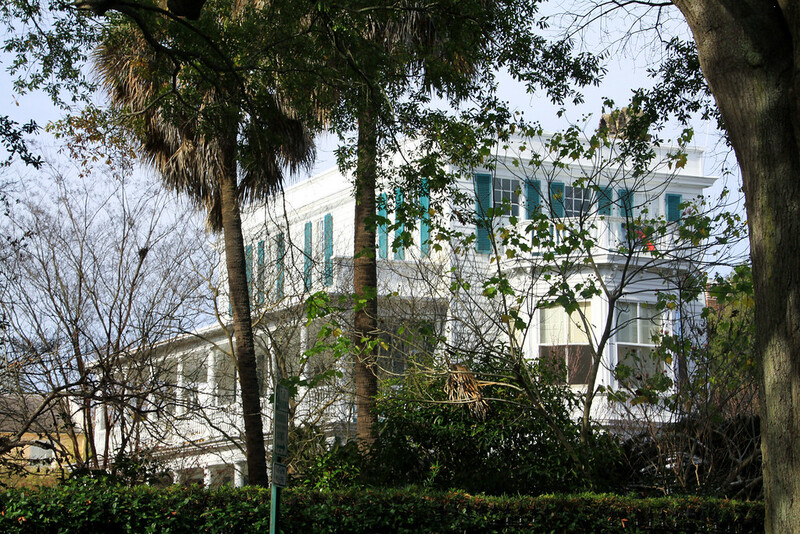 Dereef Park, Morris St., Charleston, S.C. 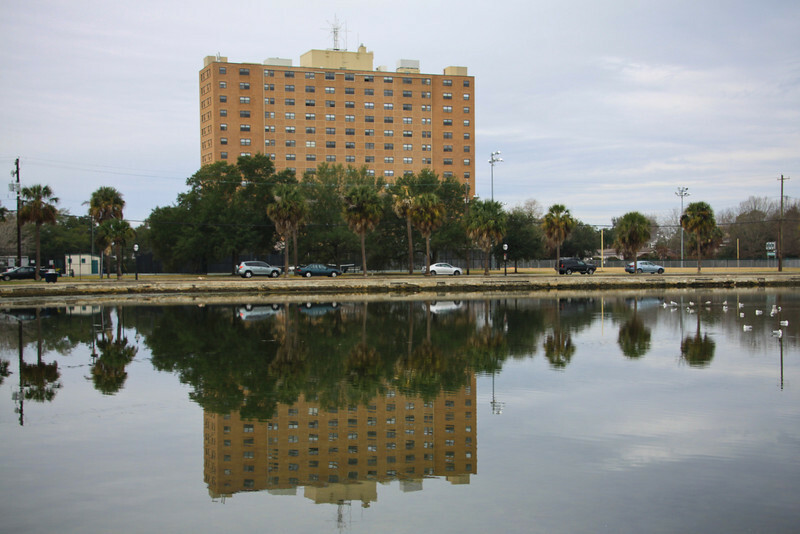 I had a meeting at Roper Hospital the other day and parked on Rutledge Ave. so I could take a quick detour to check on the activity at Dereef Park on Morris St. 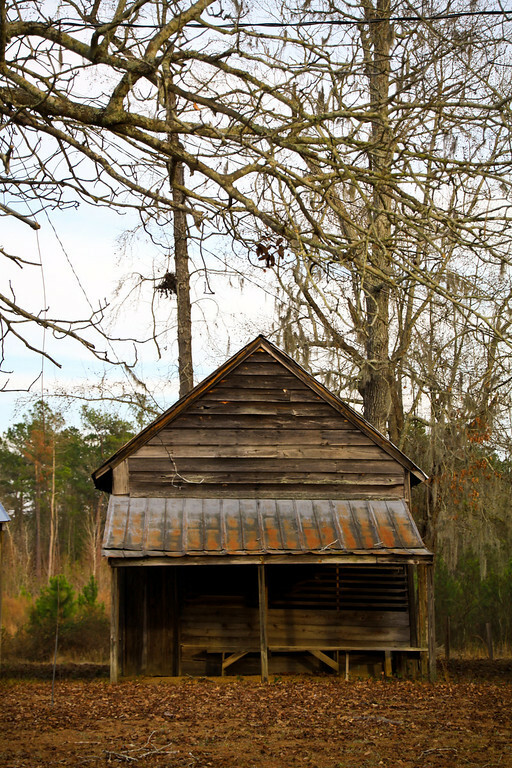 The little Praise House has been in bad shape heading to worse for many years. 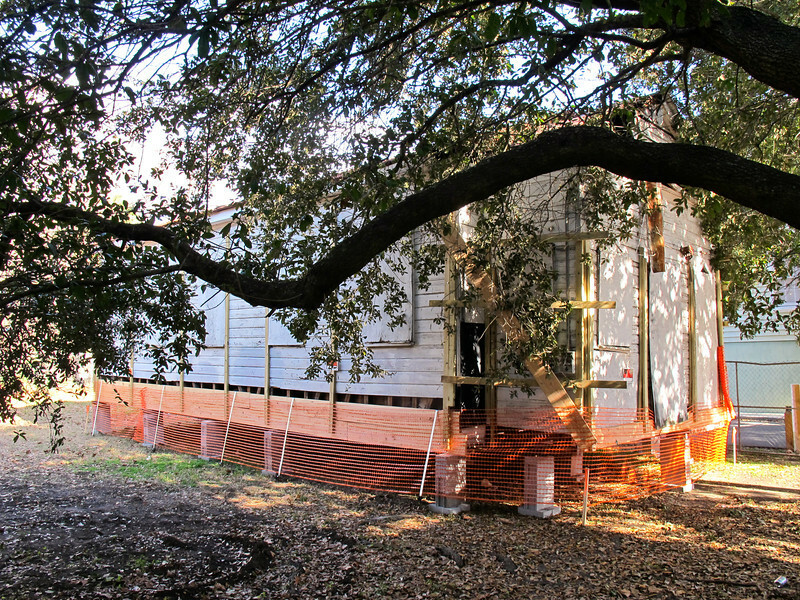 The current plan seems to be to move it to the other side and the city of Charleston intends to repair it. I am relieved. It is a favorite of mine and on my list to fix up when I won the lottery. This relieves my mind since I never even remember to check a lottery ticket. I'll be happy to see it fixed up and usable. 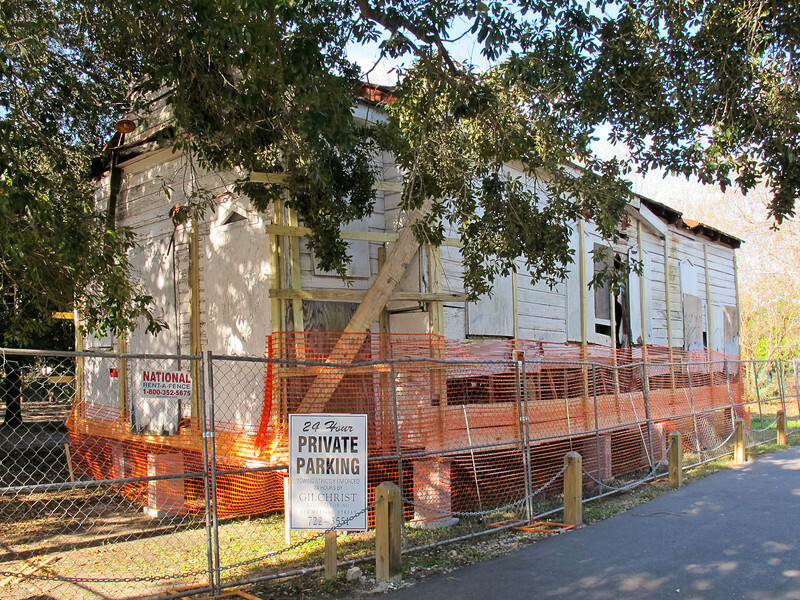 Click here to see the news about Dereef Park. A toast to bright sunny days! 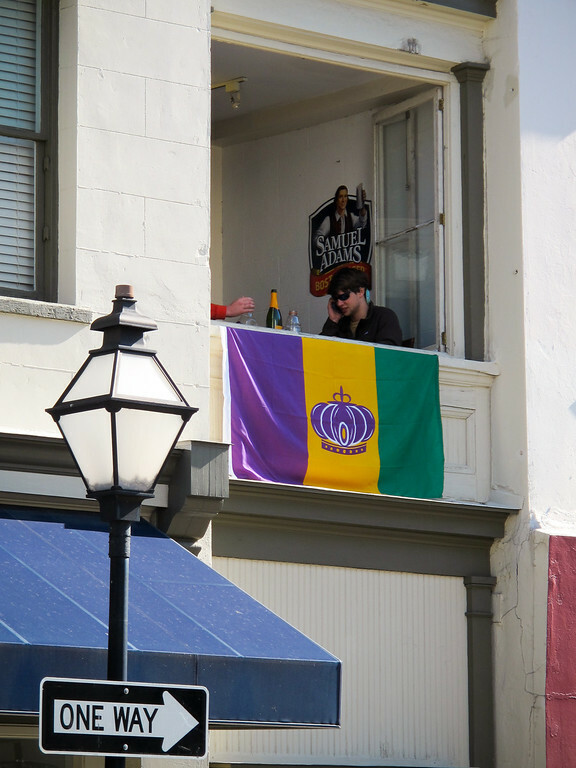 These gentlemen threw open the windows, hung a flag and turned their second level apartment into a bar porch. 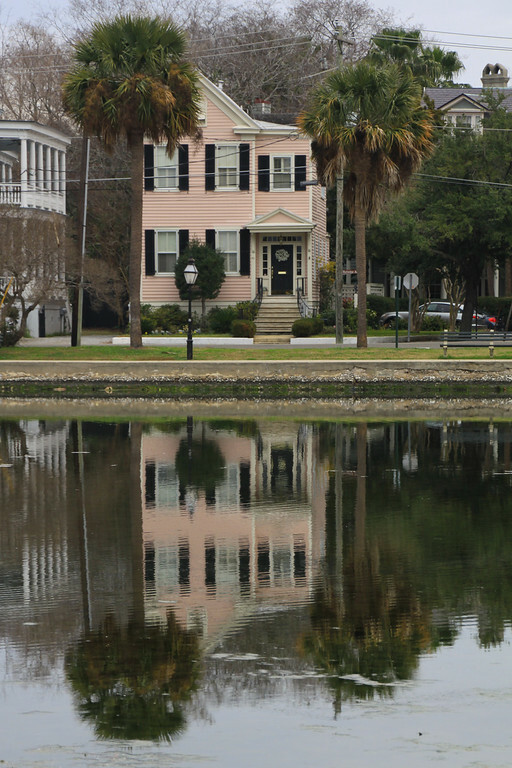 I took this on Saturday so it might have been the perfect spot to watch the Charleston Marathon action. I realize there has been a lot going on today with Martin Luther King events and the inauguration, but I worked and haven't had the television on yet. I got so much done working the holiday I wish I had a week of days like today. It was wonderful. Without meetings, hundreds of emails or the phone ringing I actually got some things checked off my "to do" list. May I have another please? The rest of you relax for a couple of days and let me catch up. I've been decorating my home with some of my old photos on canvas. 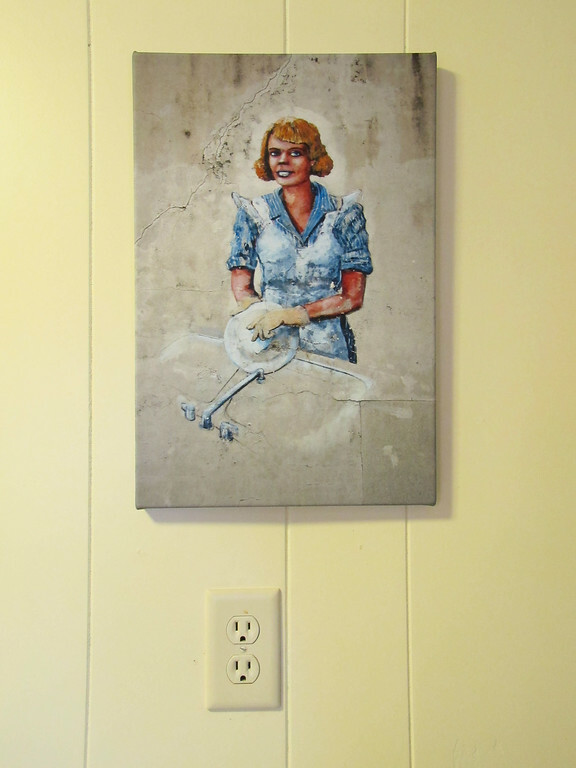 Canvas is perfect when the original is a picture painted on textured wall and doesn't need expensive framing. I've become a frequent costumer of Canvas 4 Life and I've been tickled every time I unwrap an order. You upload and size your own image. Does anyone remember this old Charleston gal? 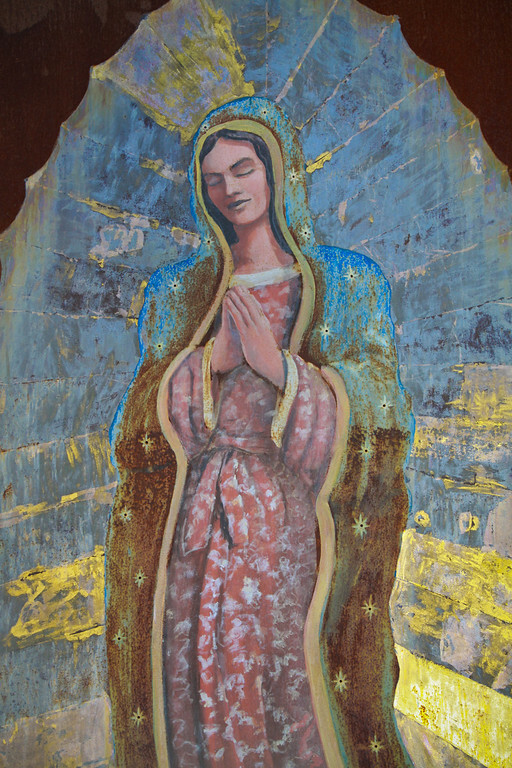 She was painted on a restaurant supply warehouse on upper Meeting St. She is long gone from Meeting St. and now lives with me. I am hoping she will come out of retirement and wash some of my dishes. Piggy Banks, King St., Charleston, S.C. This little piggie went to King St.! 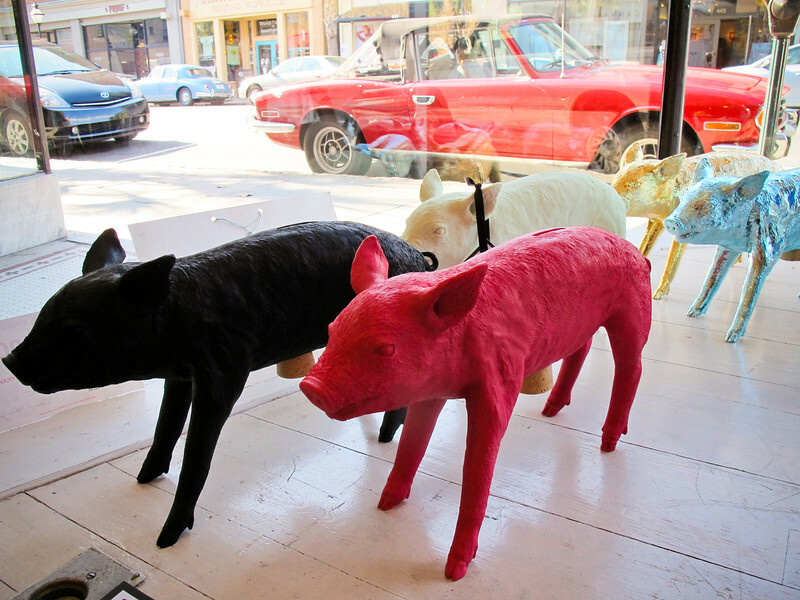 These colorful, life size piggy banks marching in the window of the Rebekah Jacob Gallery on King St. made me smile. You'd have to save a few pennies to get one but they would handle a lot of change. I liked them! I've been looking at the fashionably big and colorful "statement" necklaces and wondering if I got one I could get by without buying a new dress for an event. I think I found it! 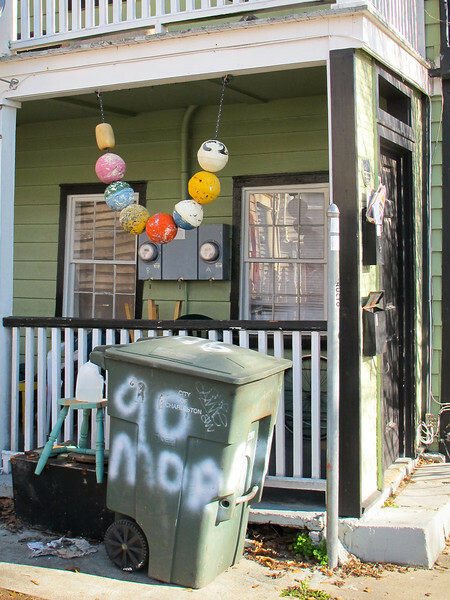 I'll need to ask these folks on Morris St. if I can borrow it for a night. Who remembers this?! Hint.....all stone chapels are not really made of stone. 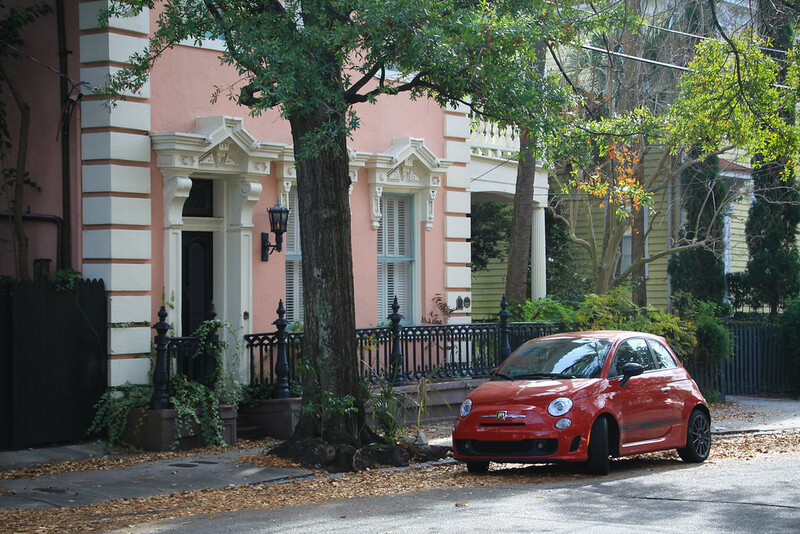 Just like extra chocolate, cheese and/or good tomatoes improve any meal, a cute car improves a photo. I don't have this car but I do have a car small enough that I am constantly thinking it has been stolen. By the time I am outraged and ready to call the police, I discover it hiding between the grown up vehicles. This happens on a regular basis. I just finished a lovely dinner party. I had a couple of my volunteers over for an early dinner. We had pear and blue cheese salads, tiny shepherd's pies and a ginger cake. Fun evening. 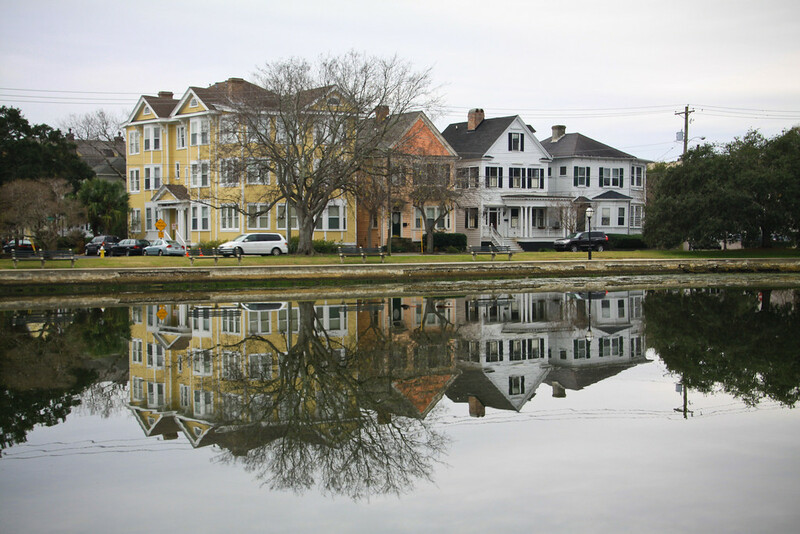 Midnight is the cut off for your Best of Charleston votes. You have to vote for 35 different things for your vote to count but if you live here that shouldn't be too hard. It's a nice way to show some appreciation for businesses that have been good to you. I will leave you to vote now while I clean up my kitchen and wash dishes. Dog, dog, cat, cat, beer. What else do you need? 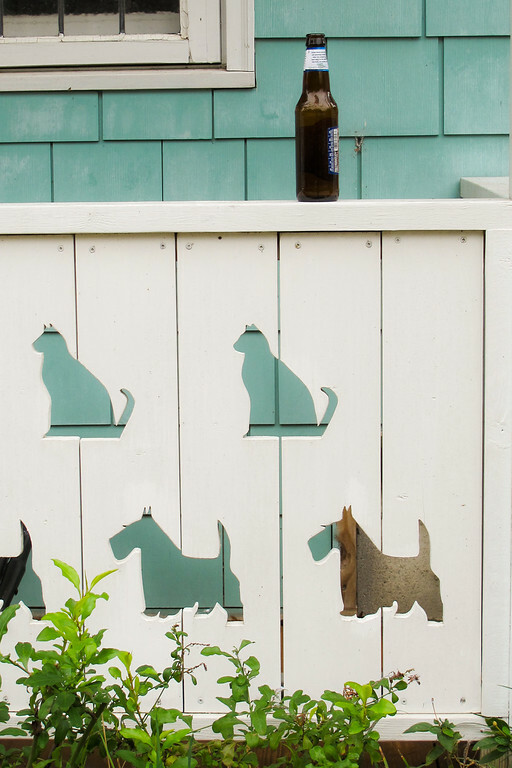 I spotted this cut out porch fencing on Folly Beach. Naturally. 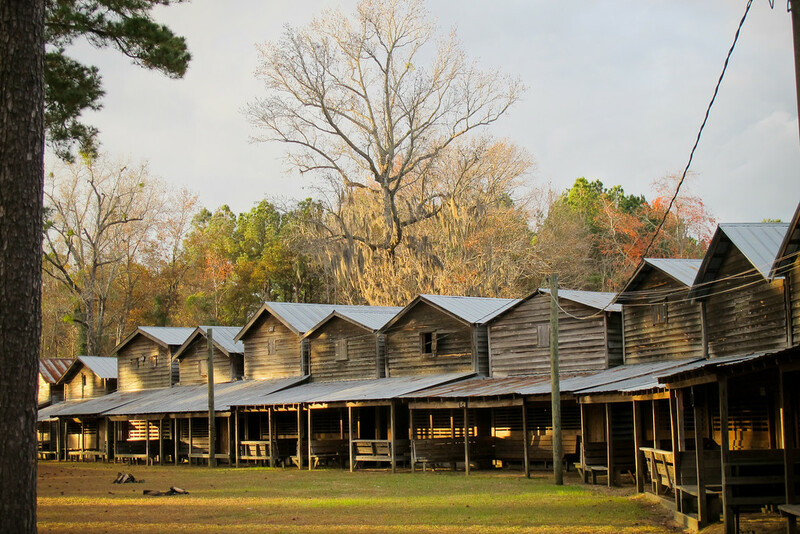 St. Paul Campground, Harleyville, S.C. 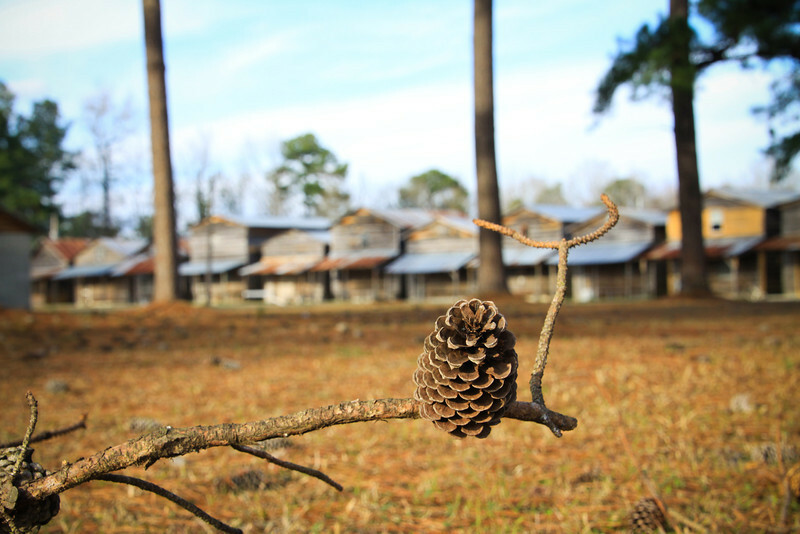 I recently posted a photo from Indian Fields Methodist Campground on Facebook that sparked a discussion bringing to my attention that there were other camp meeting grounds that I was unaware of. Just when I think I've almost explored it all, bingo! I tracked down two more. 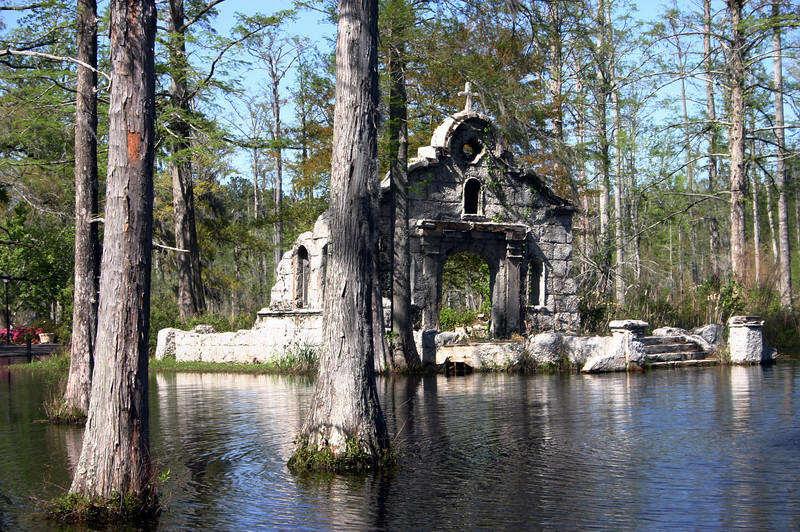 This evening's feature is the St. Paul Campground not far from Harleyville. 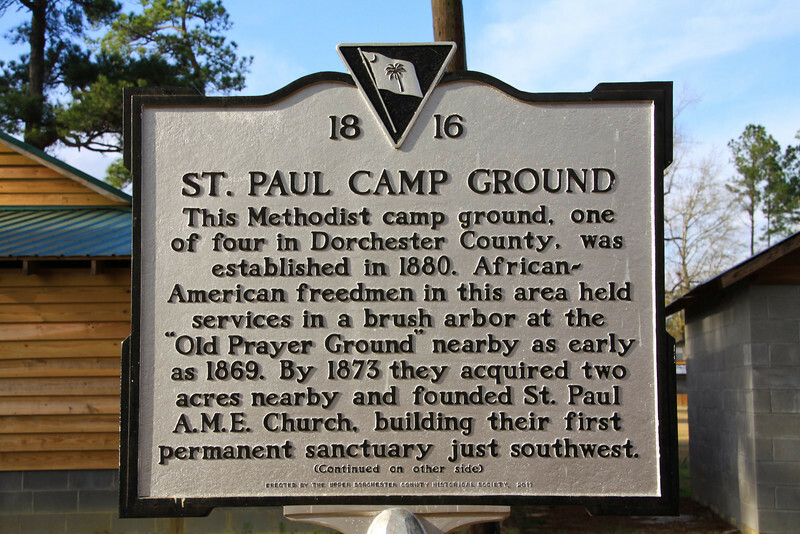 St. Paul Camp Ground is an excellent example of a Methodist camp meeting ground. 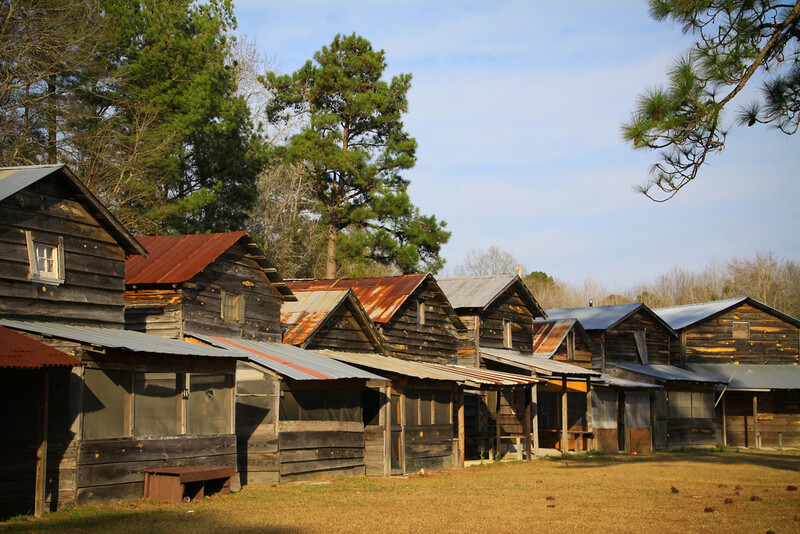 It contains the buildings common to such properties in South Carolina: a tabernacle, tents, stores, and privies. However, this campground, believed to have been established ca. 1880, was organized by African-Americans belonging to St. Paul A.M.E. Church. The buildings and grounds are used for one week each year (at St. Paul, the week ending the third Sunday in October). 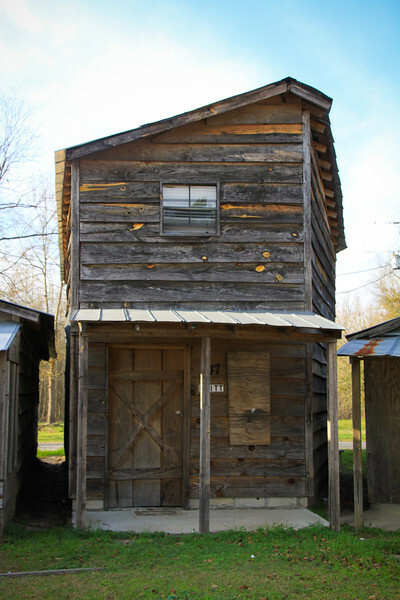 The tabernacle is a one-story building clad in rough-sawn weatherboard, with a gable-on-hip roof of V-crimped metal. 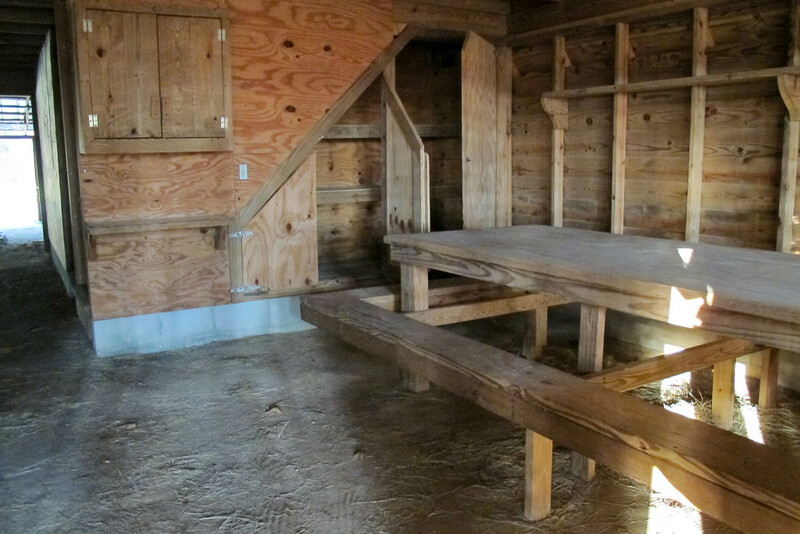 There are no windows; two entryways, without doors, are evenly spaced at each side. 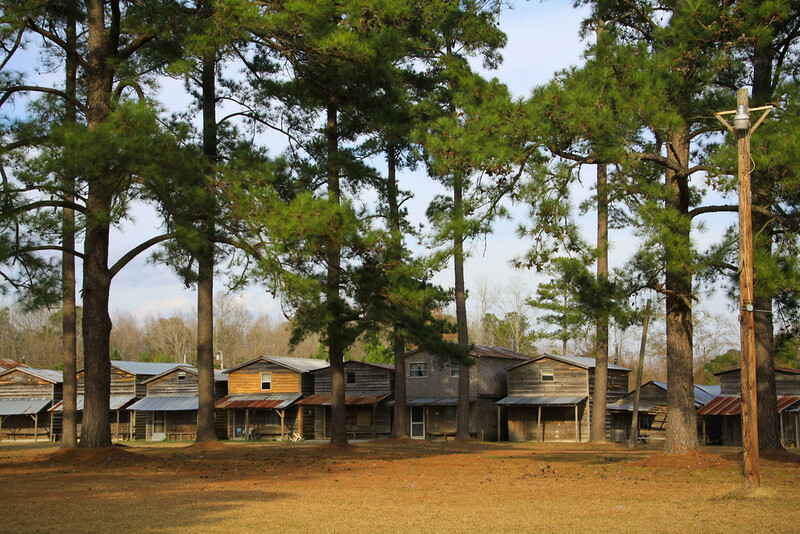 There are 54 tents, two stores, and a storage house on the numbered sites at St. Paul Camp Ground. 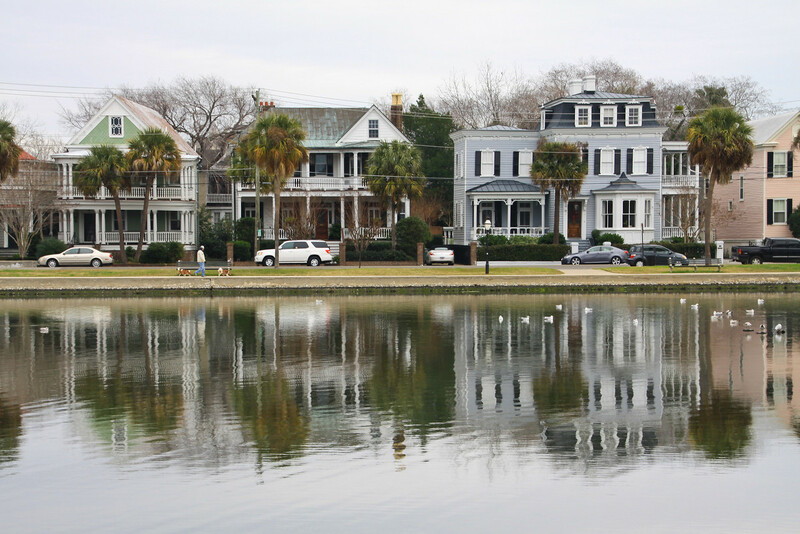 It's been a glorious weekend in Charleston. Warm enough to tease my azalea into blooming and that is a worry in January. I've done lot this weekend but not all of it sitting here at my computer so here is a quick fun photo. 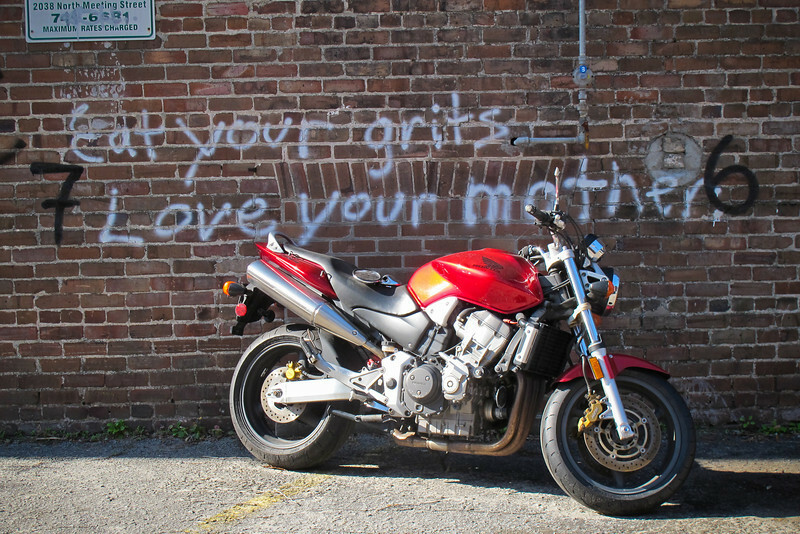 Eat your grits. Love your mother. This is a tasty burger! 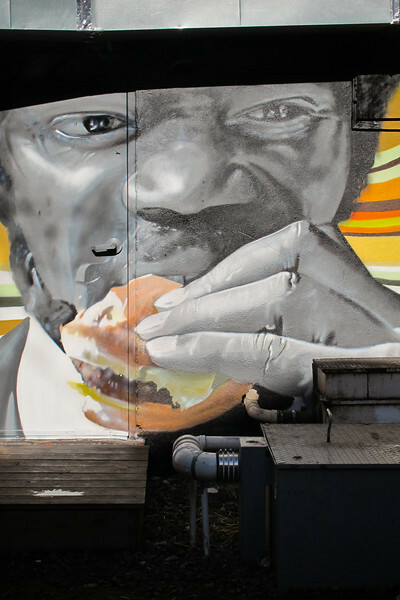 Samuel Jackson eats a tasty burger, Big Gun Burgers, Charleston, S.C. 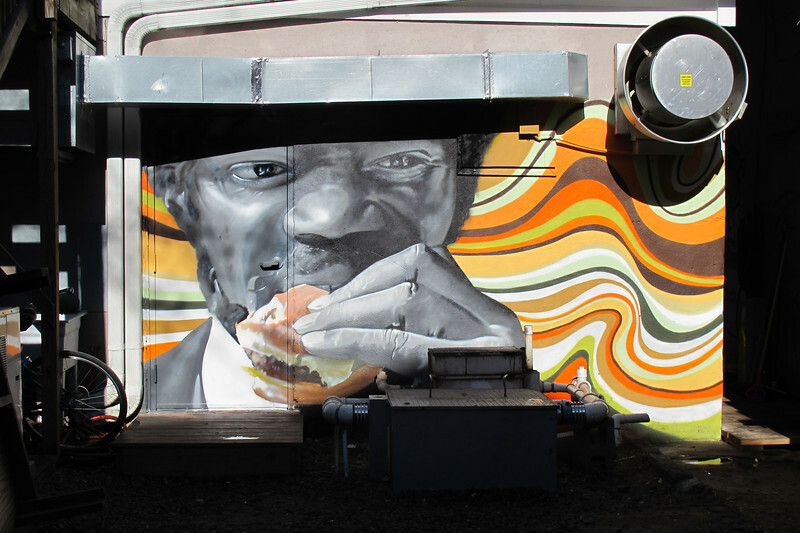 I heard Samuel Jackson had made an appearance in town and tracked him down this morning. He is hanging out at the back of Big Gun Burgers on Calhoun St.
Link to the related video clip from Pulp Fiction if you don't mind a bit of language and violence. 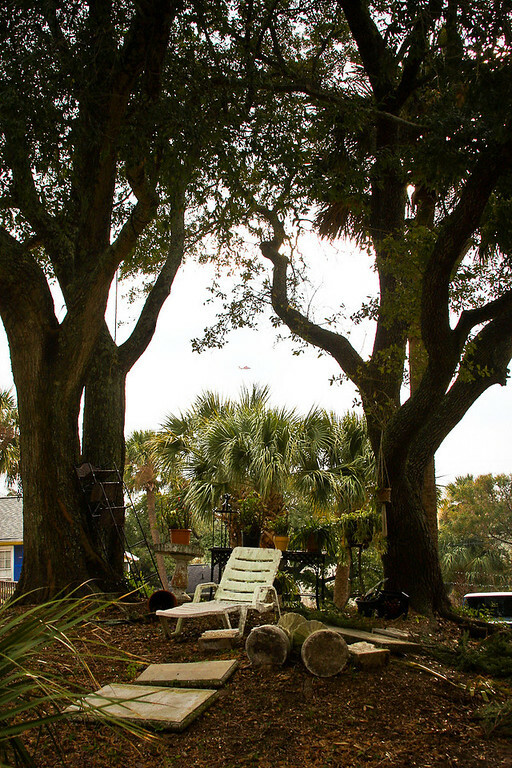 I like how these folks made a relaxing spot on the mound between the two trees. I hope they spent some time out there this evening because it has been so lovely and warm out. We are heading into a beautiful weekend. I walked down to the Taste of India this evening to have some chicken curry with a Scottish friend who used to work for the Foreign Service. She had a samosa emergency. What else have I done this week? I joined my friend Andre at Husk on Sunday after his four sons flew in to spend his birthday with him. 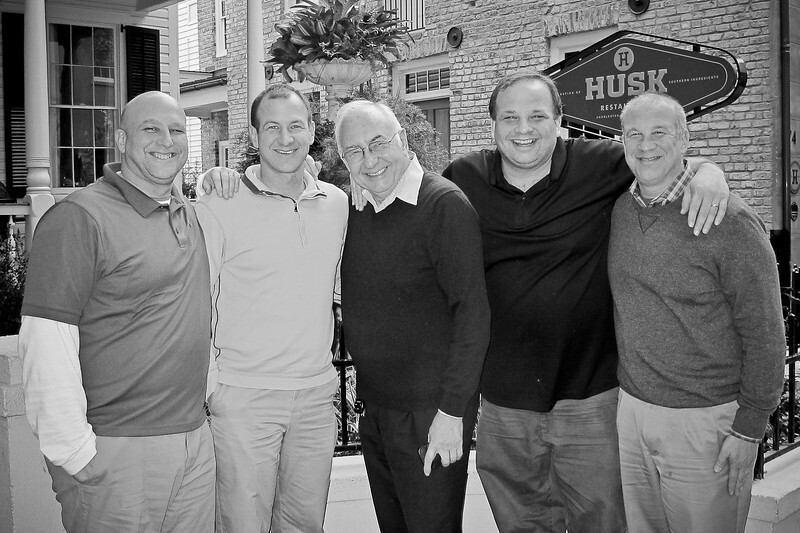 Yep, me and five gentlemen at Husk. Not a bad deal at all. 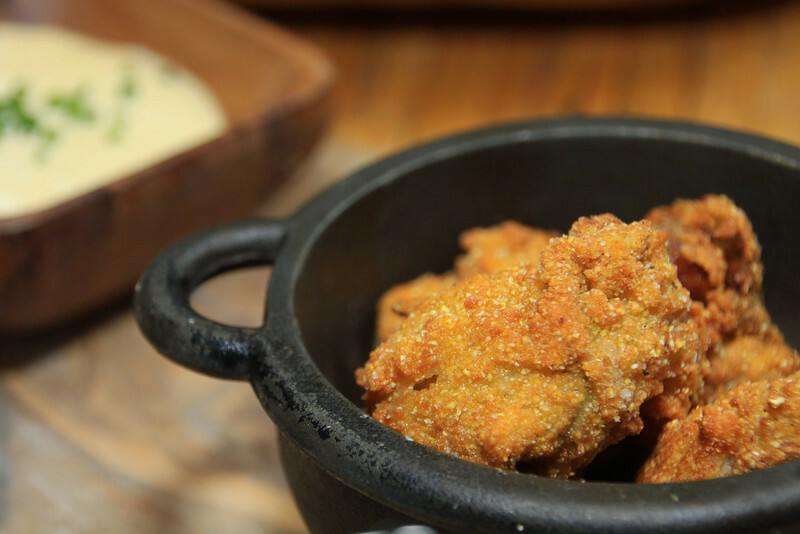 I am still thinking about those fried oysters. Andre looked so very happy across the table with all of his sons together. What a great gift they gave him by gathering together to celebrate. Okay, kids. Let's see what we can make of this weekend! With some of the leaves off the winter branches houses that are normally tucked away are more visible and all of sudden you see things a different way. Hello beautiful mansion! So many people sick. Yikes. I've been washing my hands every few minutes, holding my breath after passing folks hacking and coughing in the hallways and avoiding crowds. What do you think about wearing a burka just for flu season? It would be like a full length mask, right? Stay healthy my friends. 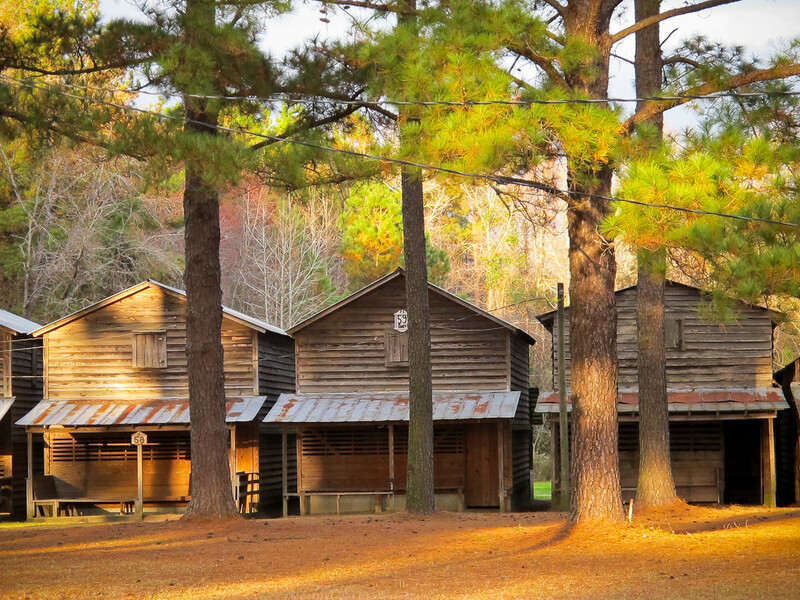 Indian Fields Methodist Campground, Rosinville, S.C.
Used only eight days a year for revival meetings, the campground a few miles from Rosinville is a beautiful and peaceful place. 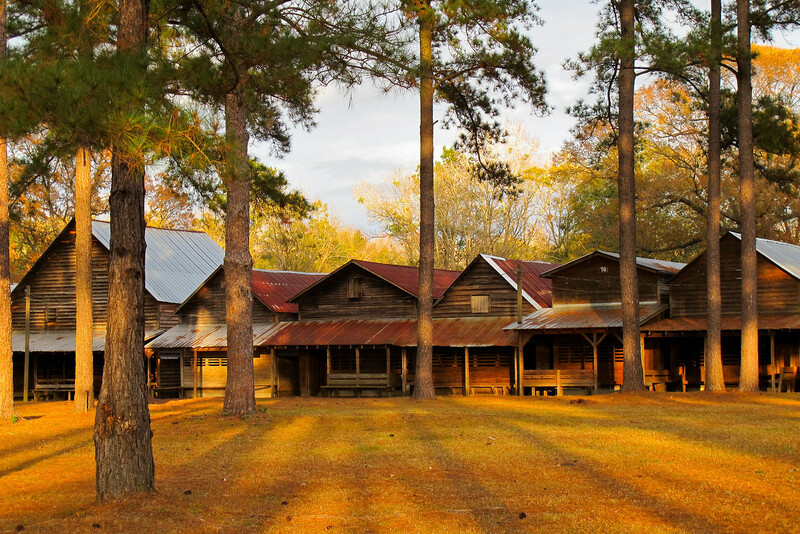 I'd like to be there when they are belting out hymns from the meeting building in the center of the circled cabins as they have each year for over two hundred years. Here is a link to a video about the campground. 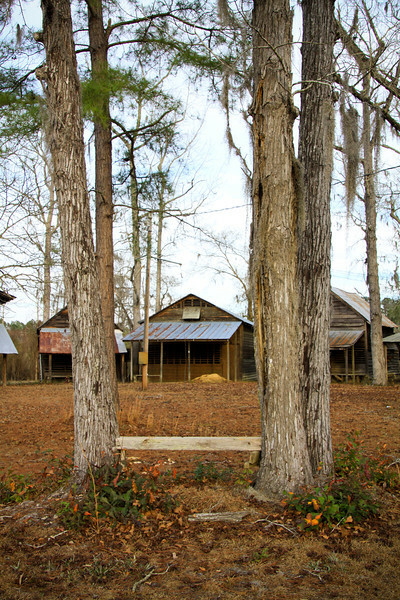 The cabins have dirt floors and there is a circle of outhouses just beyond the wooden tent cabins. Another good article here. Taco Boy, Huger St., Charleston, S.C. 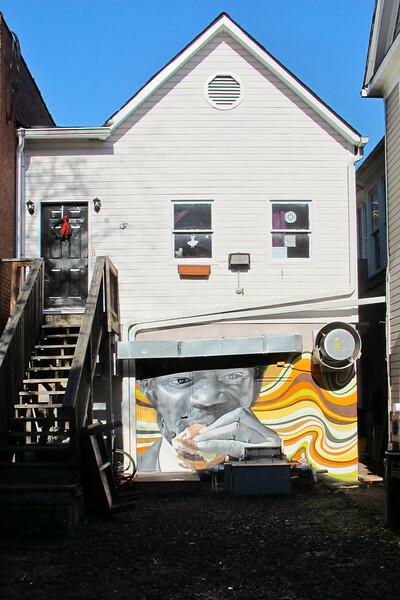 I haven't participated in Mural Mondays but according to this image search, a lot of people do: Mural Mondays. I do appreciate Taco Boy, both downtown and on Folly for their decorative art work. Thanks for taking the trouble to keep me intertained folks! 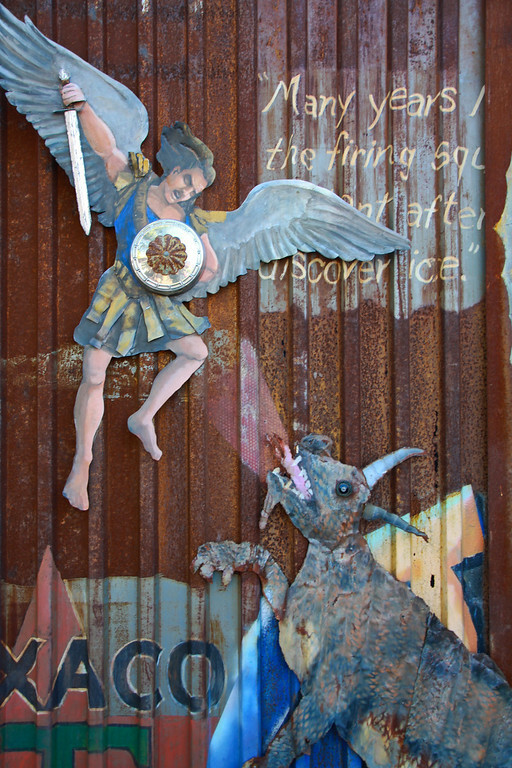 The two I am featuring today are both at the Huger St. location. For bonus smiles check out this Star Wars Taxidermy. I'd been wondering about making a giant paper mache mounted song bird head and came across those masterpieces. 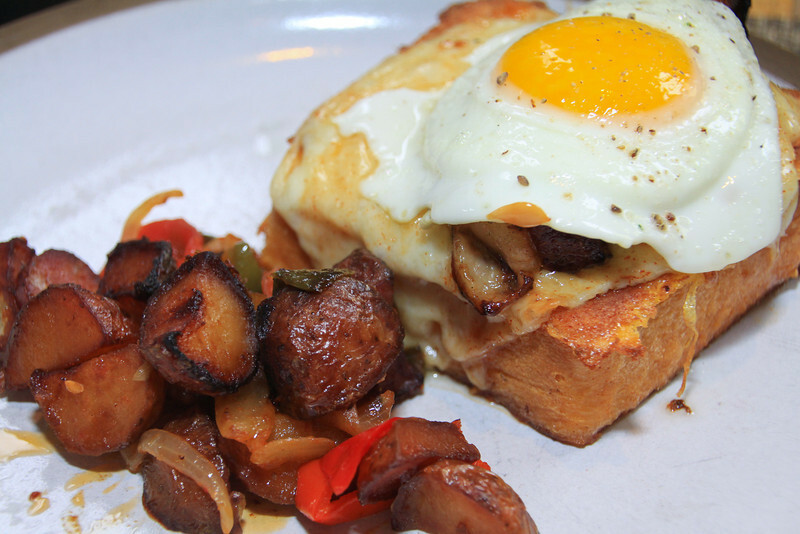 I met friends at Husk for brunch this morning and knew it would be a good idea to walk a bit before and after that delicious food. 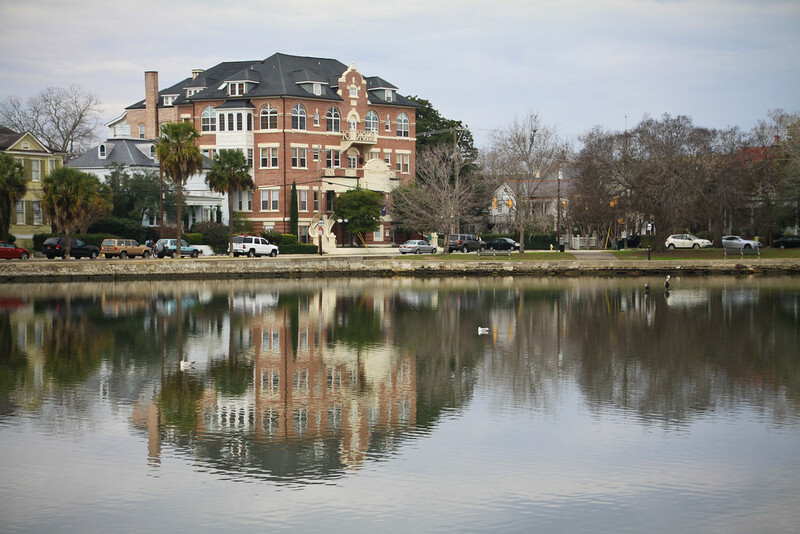 I parked at Colonial Lake and walked the loop around the lake before heading down Queen St. 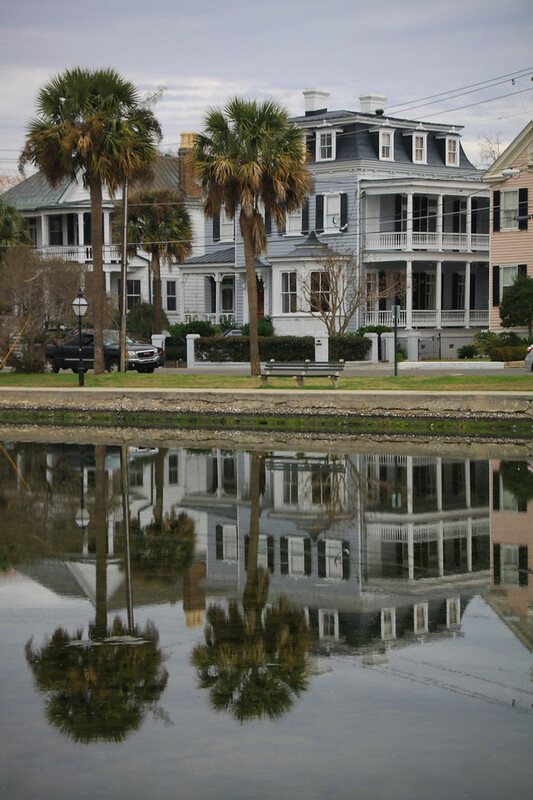 The still water made for dramatic reflections of the old houses and a nice start to my 2013 album.